LEGAZPI CITY (Feb 1) - Local chief executives and disaster officials sees a looming humanitarian crisis as thousands continue to stay in evacuation centers due to the on-going Mayon Volcano eruption in Albay. 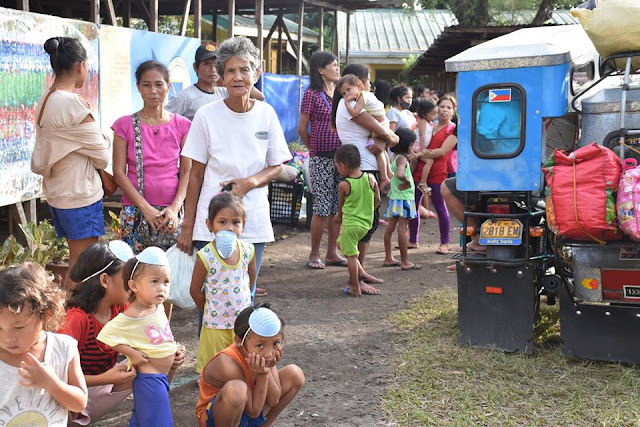 More that 84,000 individuals displaced from their homes and have been staying in evacuation centers have been reporting illnesses including fever and diarrhea as they were forced to stay in evacuation centers amid the on-going eruptive stage of Mayon Volcano. Provincial Disaster Risk Reduction and Management Council (PDRRMC) noted the rise of Acute Respiratory Infection (ARI) due to ash fall. From 561 ARI victims its now closed to 2,000. Records show that 66% of almost 3,000 residents who have received medication from the Dept. of Health suffered from ARI. 459 have fever and 272 suffered from hypertension. Previous Mayon Volcano eruption forced displaced residents to stay for three (3 ) months in the evacuation centers due to the unpredictable character of the volcano now still on Alert Level 4 from January 13 characterized by lava fountaining, lava effusion, spewing ash asin billowing ash colum as high as 3-4 kilometers from its crater. The PDRRMC is also working to get in touch with other agencies including international humanitarian organizations to help provide more facilities for evacuees. Daep said the provincial government and DOH has also began addressing cleanliness issues to avoid spread of possible diseases. Daep said hopes crowded evacuated centers can be decongested the soonest possible time.